We’ve seen this float frame art everywhere all over the internet! It’s super simple and delicate looking, and can literally be filled with anything you want. It’s also so much more interesting than your typical 2D printed artwork. For the actual frame for this DIY, you can either buy some awesome frames (like these: X X X X X), find some at the thrift store, or DIY your own! To make your own, we bought some cheap thrift store frames and pulled out the glass. We cut the two panes of glass to be the same size! We cut the frames using a glass scorer, and some running pliers (click here for a more in depth tutorial on how to cut glass)! Once you have your two pieces of glass cut, we used some super on trend binder clips to hold the pieces together. You can also hack your own float frame! We took this old (pretty simple) frame we had lying around and decided to add some pretty gold chain to it. We first took some screw in eye hooks and screwed them into the top two corners of our frame. Next, we painted the whole frame with a liquid gold leaf. Finally, we added some gold chain to the two eye hooks at the top of the frame to hang! Now that you’ve got all of your frames, let’s fill them! A general rule of thumb is to put anything flat inside of your frames! And feathers! The trick to adding the feathers to your frames is to flatten out the base of the feather with a hammer to ensure it fits perfectly flat between your two panes of glass! Try and not put anything too bulky inside of the glass, because there is a risk of it breaking is there’s too much pressure. Another incredible way to fill your frames is with pressed flowers! You can arrange your pedals in any way that you feel, but we chose to create this really pretty mandala design! We started by gently removing some petals off of these beautiful fresh flowers. Next, we laid them flat between two pieces of wax paper, with the waxy side sandwiching the pedals. Next, we placed a towel on top of the wax paper and ironed for a couple of minutes on each side. The time that this takes is going to depend on the flowers you have, just keep checking on them until they lose their moisture, stiffen, and become semi-transparent. Once they’re done, though, they become quite fragile! Be careful! Something we did notice was that the pedals did lose some colour once ironed, so try choosing some super vibrant flowers so that your design is super bright and beautiful (if that’s the look you’re going for). Go ahead and arrange the petals and sandwich them between two pieces of glass! You can also try the above technique on any other types of greens or leaves! When choosing your leaves, try and stay away from leaves that retain a ton of moisture or are too plump. These become very discoloured when ironed. We tried ironing a monstera leaf and it didn’t really work, but we did try a palm leaf and it worked! Your best bet is to experiment with different leaves. Another (SUPER) adorable way to fill your frame is with this yard word art! 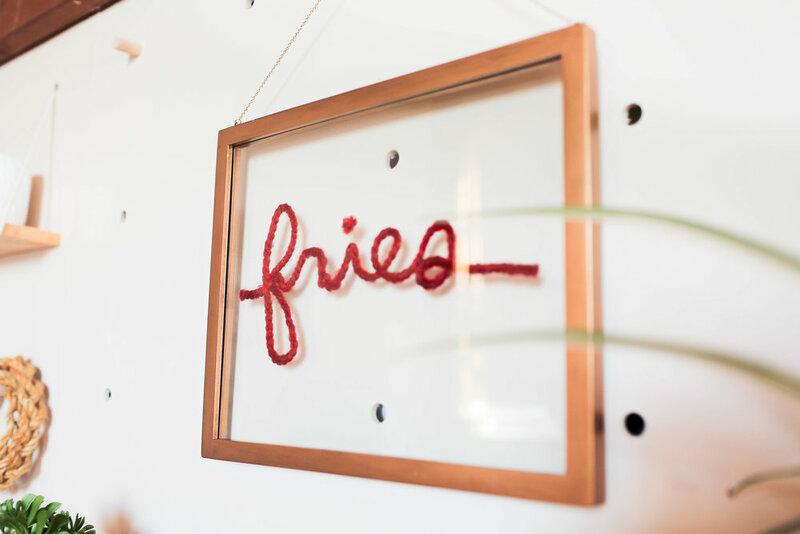 We think it’s super funny if you choose a word that isn’t necessarily pretty (we chose ’fries’). All you have to do is cut a piece of glass, and write your word with a whiteboard marker! Next, take your yarn of choice and start gluing it to the glass. As you glue, erase the whiteboard marker underneath. Try using thinner yarn, again, so that the design flattens nicely. Let us know what you would put in your frame! And that’s all for today! If you decide to make any of these DIYs please tag us using the hashtag #SorryGirlsSquad! Also be sure to check out the video below! THE NEWEST DIY DECOR TREND: LADDERS!